This is soem kind of dual report if you want to say so. I did a LP of AI because... I don't know... REASONS? Anyway, I finally wanted to finish a game with nomad planets. I started several ones but never finished any of it (don't know why). This time I want to to it better and to keep me motivated I film myself (well not really ME but the screen I'm playing on) so people can tell me how bad I am and I want to show them that I can win this. I also want to note, I'm not a good AAR writer like Pumpkin or RedQueen, so don't except any shiny story to wrap around the report. Simple report with simple facts. Some information about the campaign I created. Concentric. I like this style because it offers some easy defendable spots and some straightforward gameplay. 60 planets. Because... don't know, the number is good enough. Broken Golems (easy). Big moving ships fit to big moving planets. Zenith Traders. I ALWAYS play with them because I ALWAYS want the Zenith Generator. Spire Civilian Leaders. To rush me. I don't want to take this forever. Spirecraft (easy). Some extra Spires can never hurt. Nomad Planets (4/10). And here we go. The sole reason for the campaign to exist. I think they could make a nice team, giving the Entrenched Homeworlder a nice boost on his planets that are already hard defended. O first thought about using tank instead of Homeworlder but that would have been a slap to my face. So I go with this. I started on my homeworld which featured the sniper bonus ship. I choose this one because it has only 2 wormhole entrances and is easy to defend. I started with unlocking engineer drones mark II and III. I'm doing this in every game because I want to speed up my production as soon as possible. I don't want to wait forever for stuff to happen. I also unlocked Spider Turrets and Gravitional Turrets. I set up a simple production chain of space docks. I use one space dock for every ship type I build so I have a better overview of my production. I came to the conclusion this is more efficient instead of randomly assigning space docks with stuff I currently have unlocked. I set up my defenses like I've learned from Kahuna. Well, maybe not EXACT lieke him, most likely less effective but I want to make a LP and not a show of placing turrets for hours. I started with producing a full cap of scouts , fighters, frigates and bombers. About the 10 minute mark i was finished and scouted the neighboring planets. Melislau showed to have a design backup for armor booster and an Shield Generator Type E. I considered to hack the design but I thought it was too early. I don't have many Hack points at this point in the game and the armor booster does not seem very useful, neither to me nor to the AI. The other planet, Uvdaer, doesn't show any interesting points but I wanted to control it anyway so my Homeworld is safer and I have a buffer between me and the AI. Before I could start however, the AI sent a wave against me, containign mostly spider bots. I really had those things because they can screw up your attacks. I made a note in my head hack the design backup for the spider bots when I find it. The other ships were a decoy (probably of the Support Corps) and a flagship. 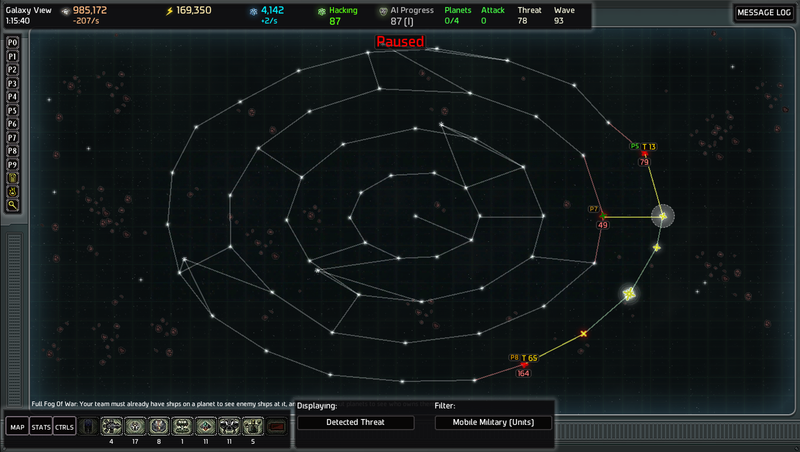 I set the snipers to go for the Flagship first and my turrets and my fleet destroyed the Spider bots pretty quickly. After this I counterattacked Melislau (because that planet seemed to me more important) with my fighters and Frigates and noticed I forgot my bombers. I brought them afterwards in but not before the MLRS Guard post could destroy all my fighters. Dammit! But after the bombers went in, I conquered the planet pretty soon. I sent my colony ship in and claim the planet, set up basic defenses and prepare my aussault on Uvdaer. During the time my defenses were set up, my Space Dock has rebuilt all fighters and any of the lost ships, so I put all ships above the wormhole, wait until everyone has arrived so I can move them all at once. I attack Uvdauer with my fleet and notice something. I forgot the bombers. AGAIN. After cursing and scolding myself, I sent them in as well, luckily this planet was easier to conquer and I don't loose many ships this time. After capturing this planet as well and setting up the defenses I come to the conclusion this is enough material for the first video,so I end here. What wonders might me await next? Of course more mistakes from me. Mistakes everywhere. So, here is the video if you want to look at my shame. Also, don't hate my thick accent. I know I'm bad at this. You should ignore all the other videos I have on my channel because they are all in German. scolding myself, not scaulding myself. I think the second might be the british english form for scalding (v. burning with non flaming liquid or Adj. a liquid hot enough to cause burns). Beyond that, you might want to provide timestamps for the ends of posts so we have some idea how quickly you are moving through. Timestamps during would be a bonus. Also, if a nomad is approaching you and you think contact will be made soon, and it influences your strategic choices, please make a note for the reading only folks. Pumpkin and Queen are the writers around here, no shame for not writing a story alongside. Okay, because a screenshot was requested, I added one from the end of the video. About timestamps, I can say what time it is before and after the video but it's hard to keep track DURING it. Also I don't like to watch and hear myself playing, that's why I never watch my own videos. It's just a mental thing. Maybe I will try to take notes during the game but don't except to much. I'm too busy with the game and the video. I scouted Asnofenfen and Tioja. Asnofenfen has a A Generator on it, so I mark the planet as important. It also is heavily defended with a fortress and multiple guardians. I consider to conquer it but first want to check out the other planet. Only to notice that I don't have any intel about it because there is a counter-spy. To make it even worse, it is protected from a forcefield. Luckily there exist raider starships (I locked the raider fleetships out of the game by not selecting them on the galaxy map at the start),so I built three and send them to raid the counter-spy. During that tiem I rally my other fleet ships at the wormhole to Asnofenfen to attack there. However, after the cs is destroyed I decide to skip the A Generator for now because the planet might be too strong and I should first unlock some stronger ships. So, I scout Tioja again, this time I have a better overview how CRAPPY the planet is. There are no interesting structures for me, there is only one metal spot to mine and it is very poorly guarded. However, it was the nearest planet that has a connection to the next inner ring (can be seen on the screenshot) without counting any Nomads. And since I don't want to rely on Nomads I decide to conquer it and even make it my first defense point. I waited for another wave to pass by, this one was rather weak (only bombers and a single Plasma Starship that panicked me first but didn't even get to my command station). I quickly overhelmed Tioja with some losses because I underestimated the power of the forcefield ( I used my raider starships to make up for this later) but it was still in the tolerable range. I didn't trigger any reprisal wave which surprised me. My whole bomber fleet was destroyed. During the time I attacked the planet, there was a Zenith Trader coming through, so I waited until it reached my Homeworld and build a Zenith Generator next to my Homestation. I keep in mind, if the Zenith Generator gets destroyed, my Homestation is pretty much doomed as well, so that's probably the safest point in the galaxy. I capture Trioja and build a military commandstation there. I also build a full cap of all turrets on this planet and unlock Gravitational Turrets Mark II and Tractor Beam Turrets Mark II. I also unlocked Area Minefields a little earlier int he game and they fit perfectly in my defense system. I renamed some of the planets to notice faster where the important stuff was. Also so I don't have to pronounce those terrible names anymore. I scout the next two adjacent planets. Yiun doesn't have anything for interest. Except that BIG ARMORED BROKEN GOLEM! I decide to capture that late. Also, because this is my entry to the inner rings which I pretty much want. The other one has a C generator, so I could take it down but I want to leave it, so the AI attacks me from that spot. It also has a Mark V Fabricator for Bombers which could be more than useful for the Fortress on Asnofenfen. I decide to hack it and sent my hacker on it's way but because the video was already too long and I don't want to sit it out to stretch the length even more, I decided this is the first thing I do in the next video. I put a note on the planet so I don't forget what I wanted to do there and then end the LP. Awesome defense unlock choices, and thank you for the timestamps and picture! I'm guessing Asnofenfen is P8. I think if P7 is Yuin. On the note about the C generator.. you will probably encounter another C generator world you need later meaning P5 can be left alone safely. As a counterpoint, the bombers from that fabricator would enable you to easily beat the fortress at P8, gaining you the ARS in that system. My stance on the plan for P5: Hack it. you're sitting at 87 HAP, a Fabricator hack costs less and it would secure use of high mark bombers in your service for the remainder of the game. After hacking, never capture P5 but leave it as a live incursion point. I couldn't resist a forget the bombers joke after part 1, with how it repeatedly plagued your offensives. Keep on rocking on, looking forward to part 3! Damn, this was AWEFUL. I don't want to go much into detail this time and I really cannot recommend watching the video because I screwed up multiple times. It's one thing if you mistakenly forgot something and remember it later to fix it. But it is another thing if you just feed the enemy with your attack. What I wanted to do in this video was to destroy hack the Mark V Bomber fabricator (a Mark V fabricator right at the start? That's just awesome, especially with such a good fleet ship like the bombers) and, if I had some time left, take Yuin, the planet with the broken golem. However, it all ended in a downward spirale of death and destruction with me fighting almost over the same stupid planet (I even renamed the planet to that) again and again. Melisiau, a planet I took earlier, was target of a wave. Now you might ask "How can this be? You gate raided it. "and you would be obviously right. You see... I didn't notice the Warp Guardian on it or maybe I DID notice it but didn't bother with it. So I wait for the wave of the enemy, destroy it. There are some cloaked decloakers in the wave that destroy my command station but Idon't give a damn and start to rally my ships to destroy the warp guardian. I succed... not. I bring it only down to a TINY bit health left, so I decide to send a small fleet in to detroy it. Doesn't wortk either. So I just curse the damn guardian and send my raider starships that put an end to its (and mine) misery. Now, this wasn't the bad part. Because hell broke only right after this. You see, because of my stupid ttempt to destroy ONE SINGLE ship I lost an entire fleet. You know what this means? Yea, right, it's reprisal wave time! Luckily only a level 1 wave. "How had can this be?" thought silly me. Well, the wave itself was actually kind of easy. However, the AI suddenly decided to pop up with the Threat fleet which I've ignored so far because I didn't think the Ai would be so bold and attack so soon with it. Oh, look, a heavy bomber starship! Oh, look, a Mark 2 leech starship! Hey, isn't this a plasma siege starship about TO MURDER YOU?! Yeah, i realized how screwed I was at the moment. I desperately tried to save what I could. The funny part is, really every fleet ship was stunned from the spider turrets, so the only problem left were the starships. They destroyed my commandstation (hey, I just rebuilt that!) and I imagined I could simply take them down with a big fleet. So ALL my fleet ships sended in and I wanted to take the plasma starship out first so it cannot kill my home commandstation. You know what I've totally forgotten? The Mark II Leech ship! Oh boy, what a fun to see EVERY ship you had turned against you. It didn't had a fleet left! The A didn't had a fleet left and I just give it a new one so it can go on with its murdering spree! I tried this scheme again two times until i realized that this does not help me at all. When I finally came to my senses, I could manage to destroy the fleet and take back MY planet (yeah, don't comfortable in here). Oh, did I also mention that i scrapped my fabricator hacker right BEFORE it finished the hack? That's right, I thought it was already done and because I was kind of packing seeing how much I screwed up, I wanted the bombers as fast as possible, but what I accomplished was to wait even longer for the design. I still could defeat the fleet without it but all my metal was long gone anyway, so I couldn't have gone any further. Some happy things to mention anyway: Mark V Bombers for the entire rest of the game. This should at least ease up most of the stronger defended planets. I also fortified the Defense Grid planet even more. A trader came through and I purchsed Black Hole Machine and Counter Spy to protect it. The best part about this is, all the waves have to come through this point but cannot leave it until they are done with their work. And all Decloakers, which can put uo a real ood fight, will instantly destroyed. How do you like this, AI? Try to catch me now! Video is currently loading up but I don't recomment to watch it anyway unless you are a sadist and like to watch me suffer. I lost my temper also at some point, not that much that I'm screaming uncontrollably but it's very close to that. Hah, that's part of the point of an LP though! EVERYONE screws up at some point (usually many, many points) when making an LP of anything. It seems to be part of the process. Often it's also part of the entertainment for the viewers. Anyway, I might have a watch myself, of these vids. I've often LOOKED for good LPs of the game that ARENT of super-ancient versions (which is all I've really found up to this point) yet never find them, but as you're actually doing this with a recent build, this should be interesting. Okay, there didn't happen enough in this video to make it worth to put up a longer text, so i sum it up what happened. I tried to conquer the Golem planet and failed twice. Suddenly Riot control starships popped up from nearby systems and rushed to help the planet, destroying my fleet. I'm currently struggling to find the proper strategy to counter this because every time I enter the planet and seem to win, the Ai comes back with the Riots. I also defended another weak wave and built the counter Spy on Defense Grid, rendering every cloaked ship from the AI useless if it comes through this planet. Some advie how to counter a large fleet of riot starships would be nice. Don't say bombers because this didn't work. I thought of some strategies at the end of the video, just check it out. Time at the end: 03:04:02. Big improvement compared to the last video. To sum it up, I finally took Golem. It as a long and hard battle with losses on both sides but in the end the AI was so desperate that it suicided single ships against my idling fleet. I found the perfect counter against the riot control starships: Plasma Siege Starships. So I unlocked Mark II Plasma Siege Starships and also Mini Fortresses. I prepared a fleet of snipers, fighters and missile frigates and stationed them at Defense Grid. When the fleet was ready, I noticed that the AI was about to launch a cross-planet attack, so I waited and waited. The AI parked its carrier at the planet adjacent to Defense Grid but it never attacked. It wanted to wait until my fleet was removed from the planet, which I didn't do. So after waitng for a looong time with no one doing the first step at that time, the Ai threw a regular wave at the only planet it could, only to loose it again of course and then moved the whole CPA fleet away and out of my sight. Even if I realized what it wanted to do (circling the enitre galaxy ring to attck me from the OTHER side), I decided that I have more than enough time to start my siege at Golem. I also finished the Zenith Generator in the mean time while I waited for the CPA, so since I had a big energy oputput right now, I built some backup turrets, two mini fortresses and a forcefield to retread on Golem. The first battle was massive and went quickly out of control, so I retreated most of my fleet directly to the forcefield. The Ai did what it always did on Golemt and sent the Riot Control Starships in. However, being prepared this time, it was an even battle. I lost all of my fighters, most of my frigates and almost every sniper I had but in the end the AI came to a stalemate and couldn't force me out of the system anymore while I also couldn't destroy the planet. However, in the meantime teh CPA has reached the other side of the ring and attacked me at Stupid Planet. It was at that time I panicked a little. In a last attempt to stop it there (building a fleet was too late and I had no fleet left to retreat tehre) I spammed area minefields at my home planet and waited. Stupid Planet was just a simple meat shield to take the worst of the attack and also destroying some of the ships, easing up a little the overall attack. Not caring long enough for Stupid Planet, the Ai sent its wave into my Home but luckily the minefield were ready and it stood no chance. I lost Stupid Planet but that was okay, there was nothing important anyway. it was more important to save my home command station and my Zenith Generator, which both didn't even get a scratch. I rebuilt my fleet and started to retake Stupid planet. The Ai retreated the fleet anyway from there, so there was nothing left to fight over. When this was done, i took my fleet, settled it at Golem and began my conquer of the planet. While the Ai didn't had anything powerful enough to stop me, it still could destroy some of my ships. But in the end I defeated it, captured the planet and were happy that I made this big advancement. On a side note: Nomad 1 has reached my planets, first Defense Grid, then Uvdaer next to it. It won't however link to my homeworld as it seems right now because it's about to move away again. So let's just hope the AI won't use the time it is connected to Uvdaer to skip my Defense GridI'm still not hacking Nomad 1 because I first need to settle some other stuff. Defended against a Crossplanet Attack. Finished the Zenith Power generator. That's quite a lot. The next part should be easier again. Hopefully.